Foodomics is a discipline in the field of food and nutrition that applies and integrates comprehensive high-throughput -omics technologies to improve human health, well-being, and nutritional knowledge. Foodomics encompasses the global food domain, including fields such as nutrigenomics. 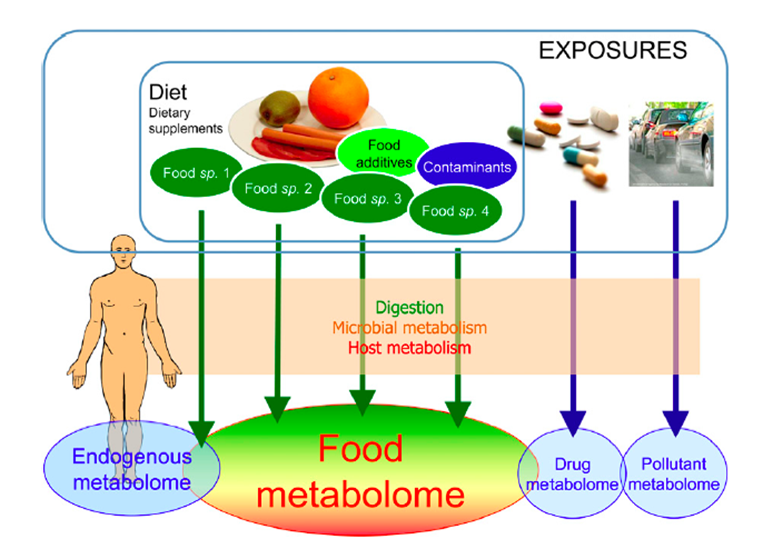 Studies in foodomics may focus on areas such as the mechanisms of different bioactive food components in the body, the quantification of dietary biomarkers to identify different health states, the assessment of food quality and safety, or examination of the body's biological response to different nutritional patterns. The food metabolome is the part of the human metabolome directly derived from the digestion and biotransformation of foods and their constituents. With over 25,000 compounds known in various foods, and an extensive metabolism of many of them by host enzymes and gut microbiota, the food metabolome is extremely complex, with a composition varying widely according to the diet. This variability constitutes a unique and extremely rich source of information on the human diet, which can be used for pusposes such as accurate monitoring of dietary exposure and identification of foods that influence disease risks. Dietary biomarkers are specific measurements within the body that accurately reflect the intake of a food constituent or food. These markers are measured in biofluids such as blood and urine, and include natural food constituents such as vitamins and fatty acids, in addition to certain food additives like iodine in milk or food contaminants like polychlorinated biphenyls in fatty fish. Dietary biomarkers can be used measure nutritional status and food intake, to find associations between diet and disease outcomes, and to monitor dietary changes in populations. A selection of papers on the food metabolome and identification/validation of dietary biomarkers. The FOODBALL Project consists of 22 partners from 11 countries. It is coordinated by Edith Feskens, Wageningen Univesity. The FOODBALL Project is supported by the EU Joint Programming Initiative A Healthy Diet for a Healthy Life through participating organization's local funding agencies.